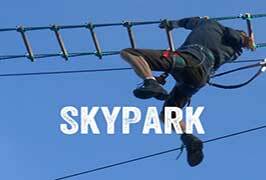 Skypark is Irelands biggest and most exciting Zip Line Adventure Park, a brilliant day out for children Families, Couples and Adults. 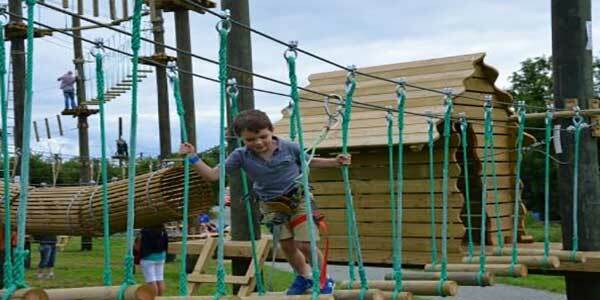 The biggest aerial adventure park in Ireland with loads of other activities that you can pay-as-you-go. 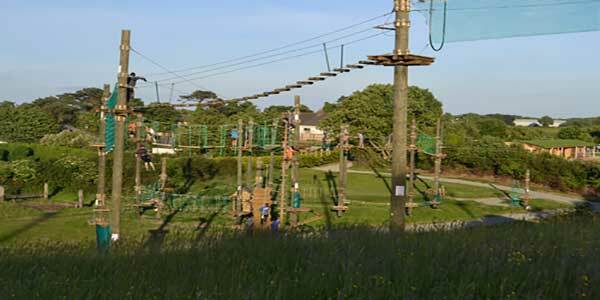 At Skypark in Carlingford, Co Louth you can test yourself on over 30 challenges including cargo nets, skateboards, giant log swings, monkey bars and of course Zip lines! With courses ranging from 6 ft to 40 ft high, there is a course for everyone! needs. SKYPARK is perfect for adrenaline junkies or those simply wanting to enjoy some of the best views in Carlingford from up high. Why not spend the day in Sky park and come for a family picnic on the beautiful grounds or enjoy more of the fantastic activities on offer. For Kids aged 5 – 8 yrs and they will require Adult supervision at all times. This course will take approximately 45 minutes to complete. For kids aged 9+ and adults, a 30-40 minute instruction session is required, before you can move on through the course. They have made some amendments to the Sky park course making it colour coded in relation to difficultly with more entry/exit points. You can Hop On / Hop Off at more points through out the course. So it there is one section that you think looks too difficult you are now able to pass on that section and rejoin the course! Foot Golf is two great sports combined football and golf to create the best game you will ever play. The course at SKYPARK is a 9 hole course but can be played twice to make up 18 holes. Play with your family, friends or your team. All you have to do is complete each hole, kicking the football into the oversized golf cup using your feet in as fewer shots as possible. Mini Golf is perfect for some golfing fun for all ages, from families, school children, teenagers and adults of all ages. Almost like Volleyball, not quite like Basketball and not a mere Trampoline, Aeroball merges all three activities into a Vertical Action Game that is the Ultimate Sports Experience! Great fun for kids and energetic adults. A great activity to focus the body and mind. Learn to shoot straight arrows from your bow with our experienced instructors. Will you hit the bullseye? Throw your frisbee around our purpose made course in as few shots as possible at SKYPARK. Great fun for the whole family and kids of all ages. Enjoy being a real life commando at SKYPARK with our group laser gun battlezone. Great for groups of kids, birthday parties and more. Safe group battles without the pain of paintball, in our purpose-built battlezone. Our kids zone has a sandpit and diggers, along with lots of toys, swingball, puzzles and more. Free fun ideal for amusing younger kids. 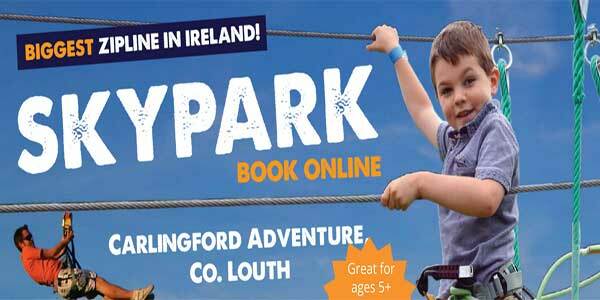 Skypark in Carlingford, Co Louth is one of the best location for your School, Youth Group or Club trip. Skypark is easily reachable from nationwide and just 1 hour from Dublin and Belfast. A fantastic day out that will have them talking about Skypark forever! Combine SKYPARK with another exciting outdoor adventure activity and accomodation at Carlingford Adventure Centre to make a longer, even more fun experience. If you are looking to organise a birthday party, and want to try something different, bring them to Skypark for up to 3 hours of fun on the Zip Line Adventure park or book some of the fun land activities. Skypark have special activity combo deals at reduced prices. For kids aged 9+ and adults, a 30 minute training session is required, before you can move on through the courses, so make sure you have enough time to make the most out of your visit. With the activity lasting 2 – 3 hours, you will need to allow extra time for food and cake. Family Fun Tip:- They do not have café facilities on site at Skypark, only machines for cold drinks, chocolate and crisps. You are welcome to bring along your own food/ drink and use the tables and chairs at the outdoor decking area. There are also picnic benches scattered around. Groups of 10 or more Birthday Child goes FREE. All children under 16 must be supervised by an adult. Adults can supervise from the ground (No Charge) or they can take part on SKYPARK (discounted rate). They have highly trained and experienced instructors throughout Skypark who will assist in training and briefing for all activities and are available if anyone requires assistance. Children aged 5 – 8 year olds can complete Sky Junior and can go around as many times as they want within their allocated time. Adult supervision is required for KIDS ZONE, Adults must remain at KIDS ZONE as kids may need assistance and encouragement. Alternatively kids can take part in many of our other land activities including archery, climbing wall, footgolf, aeroball and more. 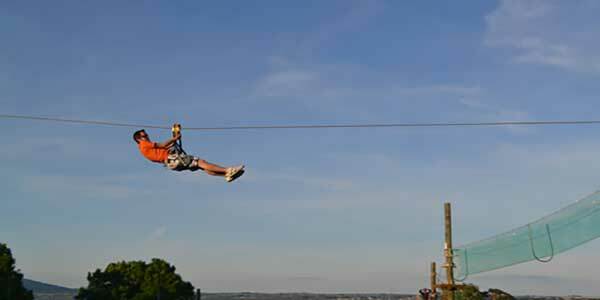 Skypark have special team activities, ideal for groups of 8 or more kids and adults. These activities include Archery Combat, Crystal Maze & Team Development High Ropes. Great as an ice-breaker or to improve team motivation and performance, or just for a bit of craic with friends. Skypark Hub has toilet facilities on site with baby changing facilities, vending and coffee machines, ice creams and assorted treats for all ages. Follow signs for M1 towards Belfast. Travel for about 3.6km and SKYPARK will be on your left. Head south out of Belfast on the M1 towards Dublin. Once on the motorway you are 1hr away. Head towards Newry, follow signs for the The Quays – a shopping centre with a multiplex cinema & Sainsburys. Turn left at the traffic lights taking you along the side of canal, canal is on your left, shopping centre is on your right and mountain straight ahead (where Carlingford is). You are now 12 minutes away. You will know when you enter Carlingford – King John’s Castle will be dominating the skyline to your left along with the harbour. Turn right into the village at the tourist office, turn left at teh T juntion (the supermarket will be facing you). Follow the one-way system, you will come to a cross-roads, continue straight. Travel for about 1.4 km and SKYPARK will be on your left.